This hip-length 80% polyester/20% cotton lapel can be used in a variety of industries and is meant to be worn over regular clothing. The garment comes with three outside pockets for storage and three non-yellowing pearl plastic buttons. This lightweight 80% polyester/20% cotton lab coat can be worn in a variety of healthcare settings and is meant to be worn over regular clothing. The garment comes with three outside pockets for storage and five non-yellowing pearl plastic buttons. 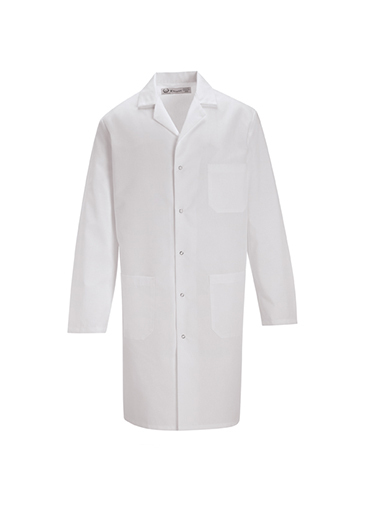 This lightweight 80% polyester/20% cotton lab coat can be worn in a variety of healthcare settings and is meant to be worn over regular clothing. This garment comes with a securely placed inside top pocket, as well as two generous lower outside pockets for storage. Hand-slits allow the wearer to access their clothing underneath the lab coat. Five non-rusting grippers make it easy to take the coat on and off. Our standard lab coat, but with no pockets. 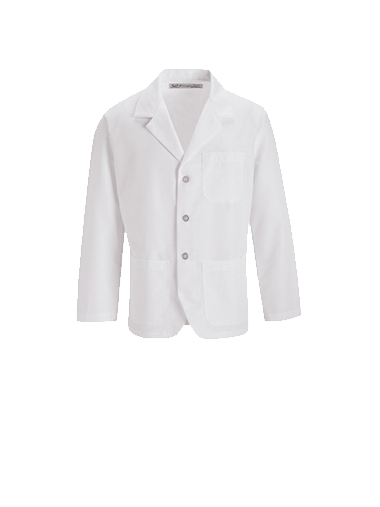 This lab coat has a lapel collar and can be worn in a variety of healthcare settings and is meant to be worn over regular clothing. For added safety, this lab coat has no pockets, so nothing can accidentally fall out. Hand-slits allow the wearer to access their clothing underneath the lab coat. Five non-rusting grippers make it easy to take the coat on and off.